Dump and push start meals are incredibly convenient for busy days and weekends. This recipe is super simple because you add almost all of the ingredients to the pot, cook on Manual for 20 minutes and then add the remaining ingredients to the pot after the Natural Release. Being able to get together your desired garnishments such as tortilla strips, avocado slices, limes, cilantro, and cheese really saves on time if you’re in a rush. The beauty of the Instant Pot is being able to prepare your meal in the pot and not have to stand over the stove and keep an eye on it. Preparing sides and garnishments becomes a breeze when using the Instant Pot! Just like classic chili, this white chicken chili variety has some kick to it. It has a spicy flavor thanks to the green chilies and cayenne. I used Great Northern Beans in my recipe but you can use any white beans you prefer. You can even add some color to your chili by using black beans if you want. It’ll still taste really good! Whatever beans you use, make sure to drain and rinse them. This helps the chili from becoming too soupy. At the end of this recipe, I created a slurry of cornstarch and water to help thicken the finished meal. If you like it the way it comes out of the pot, just omit this step. If you do what to thicken it a bit, add the slurry at the very end and Saute for about 3 minutes. Your chili will thicken up and will be creamy. Since this recipe is really simple to make, it’s perfect to make for a large crowd. This recipe serves 4 but it can easily be doubled without any additional cooking time. Serve a variety of garnishments so that there’s enough for everyone and their white chicken chili can be topped with what they like! I’m a huge fan of chili. It’s filling, delicious, and it’s really easy to make for a meal. I have other chili recipes using the Instant Pot and stovetop. You can find the Instant Pot Homemade Chili here and the Stovetop Homemade Chili version right here. This chili already has a nice kick to it but if you want it even spicer you can definitely achieve that with this chili recipe. For me, I don’t mind a little heat but I don’t like really spicy chili so my recipe doesn’t have a whole lot of spicy kick to it. If you’re the kind of person that really appreciates spicy food, you can serve diced jalapenos as a garnishment or you can add in another can of green chilies, or you can even kick up the amount of cayenne when adding the ingreidents to the pot. Serving cheese as a garnishment really helps take the heat out of the chili so have that available for this chili for those that aren’t a fan of spicy! They’ll thank you for it! 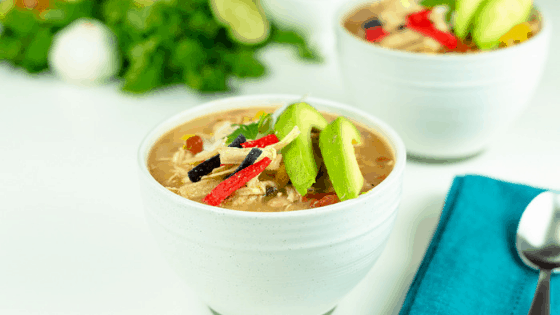 Creamy and delicious white chicken chili made in the Instant Pot. Add onion and garlic, and beans to the Instant Pot. Add the chicken breasts, spices, and green chilies. Top with 3 cups of chicken broth. Close and seal Instant Pot and set to MANUAL for 20 minutes. Allow the Instant Pot to NATURAL RELEASE for 15 minutes before taking the lid off. Remove chicken breasts and shred. I use a hand mixer for this. Set to SAUTE, add in half & half and corn, stir. Add together 2 tsp of cornstarch and 2 tsp of water. Blend and add to Instant Pot to chicken chili. Has putting the canned northern beans in at the beginning, made them mushy (after 20 minutes of pressure cooking)? Also – the recipe doesn’t mention shredding the chicken breast after it has cooked. But obviously, I should do that, yes?